Select a tune then click on the play button to hear the drumbeats. 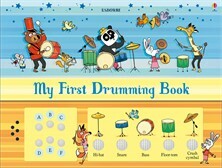 Watch a child playing with "My first drumming book"
Children can discover the fun of playing the drums by pressing the buttons in this unique book. There are five different drum sounds including snare, bass and floor-tom, and a selection of tunes to play along with. Drummers can make up their own rhythms or play along to reggae, blues, funk or pop, and learn about rhythm and beat as they play. There's an online demo at Usborne Quicklinks showing how to play along to the tunes, too.